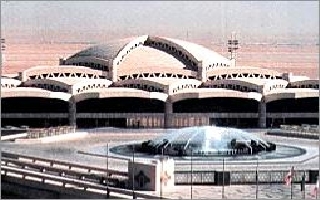 The King Khalid International Airport was opened in 1983.The airport occupies an area of about 225 square kilometers, bordered to the north by Wadi Mekhar & to the south by Wadi Abal Jernan. This area houses all the airport main facilities and installations including the terminals, mosque, the control tower and two parallel runways each 4200 meters long. The King Khalid International Airport is a masterpiece of modern architecture, blending traditional Arab design with the requirements of efficiency, and incorporating into the whole the essential Islamic character of the Kingdom.